The Top league reaches the third round this weekend with two teams sharing top spot on the table in each of the conferences. Suntory Sungoliath and Toyota Industries Shuttles have secured two wins from two matches and are on eight points apiece in the Red Conference. 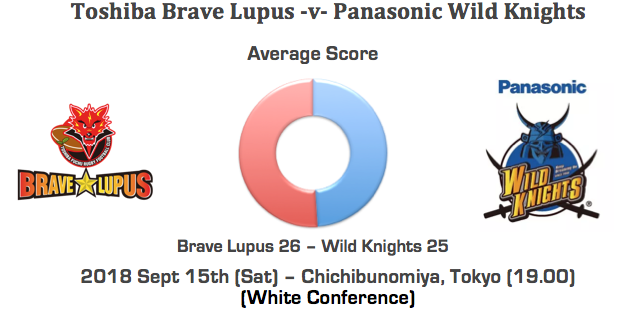 In the White Conference Panasonic Wild Knights and Yamaha Jubilo are ahead of the rest with nine points. Each team achieved a bonus point victory over Coca-Cola Red Sparks. This week's action starts with one match on Friday night - the other seven will be played on Saturday. By its own high standards Suntory has started slow this season. Their two victories have hardly been inspiring. A come-from-behind win over Verblitz in round one and in last week’s game Suntory just hung on to beat the Shining Arcs 20-18. This Friday presents the defending champions with a bigger challenge when they face a resurgent Kobelco Steelers with arguably the all-time greatest fly-half at their disposal in Dan Carter. Carter has been selected to start and will make his Top League debut on Friday. In the opening round Kobelco beat the Shining Arcs 34-27. Last week however the Steeler’s match against the Blues was called off due to the earthquake that occurred in Hokkaido. The men from Kobe have therefore had an extra week to prepare for this crucial game and will be considerably fresher. This is a tough game to call. Suntory has home advantage and has won 68% of their games against the Steelers. In the last two weeks though, the Tokyo-based team has been off the boil and just managed to get over the line. Whether Sungoliath can step it up or not for round three, remains to be seen. The Steelers can match Suntory across the park with a significant advantage in the no. 10 department. Kobelco should upset Suntory by seven points or less. These two teams have never played before. After two rounds both the Dolphins and Verblitz have one win and won loss. Last week Hino lost away to the Toyota Industries Shuttles 15-16 and Toyota ran away 29-5 winners against NEC Green Rockets. With Verblitz narrowly losing to Suntory in the last minutes of their opening game, it would seem that Toyota has moved on from that crushing loss and is back on the winning track. On the other hand, Hino while opening their new Top League account with a confidence boosting victory over the Blues, would have been very disappointed to lose a close one last week. Toyota Verblitz will be too strong for the new boys on the block and should beat the Red Dolphins by ten points or more. Toshiba has started the 2018 season with mixed results. 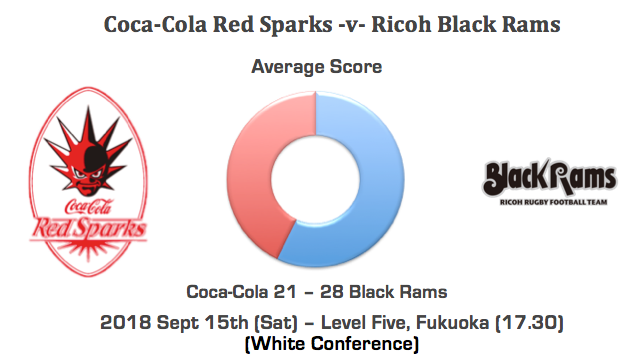 A shock loss to the Canon Eagles in round one followed by a 20-17 victory over Ricoh Black Rams last week. Former All Black and Brave Lupus’ captain Richard Kahui who plays at center, featured heavily scoring two tries. Panasonic has had the perfect start to their season with a hard-fought win against Kubota Spears and a bonus point victory over Coca-Cola Red Sparks. Panasonic looked unstoppable last weekend as they racked up 62 points. In wet and slippery conditions the Wild Knights put on a master-class display in handling skills scoring 10 tries to the Red Sparks two. On current form Panasonic has the players and the management to go all the way. It’s still early days but Panasonic is already showing signs that they are the team to beat. Even though an improving Toshiba side will be much tougher opposition than last week, the Wild Knights will be favorites and should take this by seven points or more. These two teams have only met three times with Kubota Spears winning twice. This season Kubota has recorded two losses by less than five points to the table leaders, Panasonic and Yamaha. The Eagles beat Toshiba in the first round but drew 19-all with Honda Heat last week. Since both teams are playing away at Osaka’s Expo ’70 Commemorative Stadium, home advantage will not be a factor. Based on current form and results expect Canon Eagles to edge the Kubota Spears by less than seven points. The Red Conference’s co-leading Shuttles have collected eight points from their first two matches. Both of their victories came with one point winning margins over NEC then the Red Dolphins. The Shining Arcs lost to the Steelers in their opening game followed by a defeat 18-20 to Suntory. The Shuttles are on a roll and for this game they will play at home. 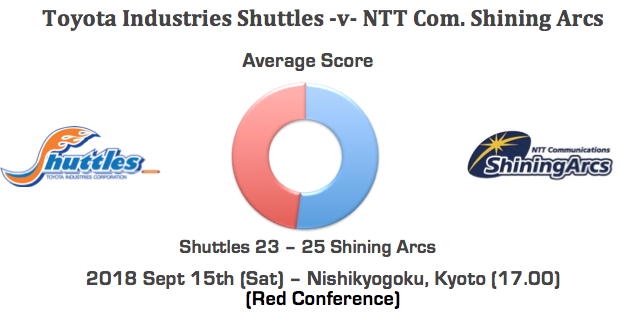 The Shuttles on their home turf should be able to make it three in a row and defeat the Shining Arcs by seven points. Jubilo is sitting pretty at the top of the White Conference. After a comfortable bonus point victory over the Red Sparks in round one they were tested by much stiffer opposition in round two. The 20-18 result was a gritty effort backed up by strong defense to sneak one over the Kubota Spears. Also contributing to both wins has been the solid form of Yamaha’s full-back, Ayumu Goromaru. Kicking with 82.5% accuracy, Goromaru has already tallied up 23 points for his team. The Honda Heat has yet to win their first match of the season. Last week Honda came close only to leave with a 19-19 draw against the Canon Eagles. Yamaha is playing at their Shizuoka stronghold and will be full of confidence after downing the Spears. Expect Honda to bring the heat but they will be outgunned by a strong Jubilo side. In fact, Jubilo has never lost to the Heat. 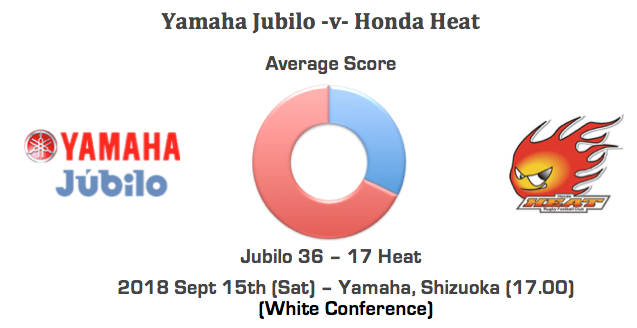 Yamaha should be able to beat the visitors by seven points or more. The Blues have played only one game this season - against the Hino Red Dolphins - and that resulted in a three tries to zip defeat. Last week’s game versus the Steelers at Tsukisamu Stadium in Hokkaido was abandoned because of the Hokkaido earthquake. In round three, Sanix will face NEC, a team that finds itself a single point above the Blues at the bottom of the table. After narrowly losing to the Shuttles by one point in the first round, the Green Rockets got thoroughly outplayed 29-5 by Toyota Verblitz in round two. Both teams are searching for their first victory of the season. 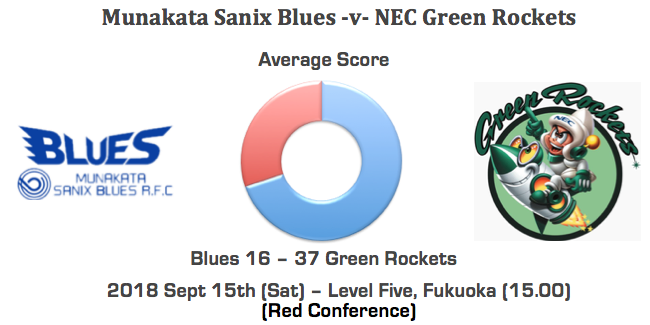 Since NEC has convincingly won the last five matches between these two teams, the Green Rockets should be able to blast ahead of the Blues by 10 points or more. The Coca-Cola side has had a torrid start to their season so far. In their two losses they have conceded 105 points - 50 points more than the second worse team on defense. To be fair, the Red Sparks happened to face a clinical Jubilo in the first round and a marauding Panasonic side in round two. Coca-Cola was simply outmuscled in the forwards and it went downhill terribly from there. Ricoh will be looking to build on their first round success over the Honda Heat after getting clipped 20-17 by Toshiba last weekend. The Black Rams have definitely come to the right place as the Red Sparks seem undoubtedly set to finish dead last in this year’s Top League competition. Coca-Cola Red Sparks don’t stand a chance. The Black Rams will be hungrier and so should win this match comfortably by 14 points or more.